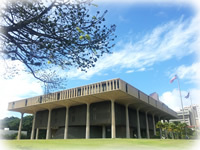 The Hawaii State Legislature is one of the three branches of Hawaii's state government. Its powers are co-equal to those of the executive and judicial branches. The legislative branch makes laws, the executive branch implements and enforces the law, and the judicial branch interprets them. The Hawai‘i State Legislature consists of 25 members in the Senate who serve staggered four-year terms and 51 members in the House of Representatives who are elected every two years. The presiding officer of the Senate is the Senate President and the presiding officer of the House of Representatives is the Speaker of the House. The Hawaii State Legislature's website is the key portal for those wishing to get informed and involved in the legislative process. The site is geared toward providing quick and easy access to the information you need in order to participate in the lawmaking process. A wealth of information is available on the home page. A search box can help you quickly determine who your Representative and Senator are; access bills and resolutions, determine their current status, and submit testimony on them; find out when chamber sessions and committee meetings are scheduled; and research the Hawaii Revised Statutes (the State’s laws). Information on all upcoming hearings is also posted prominently on the opening page. Additional resources are available for those who choose to register an account with the legislature. As a registered user, you can track your own personalized list of measures, and get e-mail notifications for hearings on specific measures or for specific committees. Registered users can also submit online testimony more easily, since much of the information needed to send testimony through the website – date/time/place of hearing, etc. – will populate automatically by entering a bill/resolution number. When is the Hawaii State Legislature in Session? Is there public parking at the State Capitol? What is the difference between a resolution (SR/HR) and a concurrent resolution (SCR/HCR)? I want to call my Representative. Does the website provide contact information for each Legislator? Where can I find the list of Acts? I’m trying to find information on a bill that was introduced this session, but I don’t remember the bill number. What should I do? I am currently signed up to receive hearing notices by email. Do I need to re-register every year? Where are the budget worksheets? Where can I find the Grant-In-Aid application? Where can I find a list of the bills in the Governor’s Package? Q – When is the Hawaii State Legislature in Session? The Legislature convenes annually in regular session at 10:00 a.m. on the third Wednesday in January. Regular sessions are limited to 60 legislative days, and state law requires a recess of at least five days between the 20th and 40th days of the regular session. A special session may be convened by the Governor or at the written request of two-thirds of the members of both houses. The Senate may also convene in special session at the written request of two-thirds of its members to consider judicial appointments. The complete Legislative Calendar can be found here. Q – Is there public parking at the State Capitol? There are a limited number of metered parking stalls in the State Capitol underground parking garage (accessible via Miller Street off of Punchbowl Street). Be sure to park only in metered stalls. All other stalls are reserved and unauthorized vehicles are subject to towing at the owner's expense. Q – What is a standing committee? Standing committees are the main working components of the Senate and House and vary in size, number, and subject area. The scope of each Senate and House standing committee is outlined in the respective chambers' rules. Q – What is the difference between a resolution (SR/HR) and a concurrent resolution (SCR/HCR)? Resolutions express one chamber’s (House or Senate) position or requests action on behalf of one chamber. Concurrent resolutions express the Legislature’s position or request action on behalf of both chambers of the Legislature (House and Senate). Q – I want to call my Representative. Does the website provide contact information for each Legislator? Yes, the room numbers, phone numbers, and email addresses for all of the members of the Legislature are available on the website. There is a link on the homepage to the “Legislators” page where you will find a list of all Legislators with their contact information. Q – Where can I find the list of Acts from previous sessions? Navigate to the Archives page (link found in the top/right section of the site) select a year, and look under the heading Reports and Lists. Q – I’m trying to find information on a bill that was introduced this session, but I don’t remember the bill number. What should I do? Use the “Keywords” searchbox to find the bill number, then use the “Bill Status/Measure Status” searchbox to access additional information like the referral, hearing notices, committee reports, and all versions of the bill. Q – I am currently signed up to receive hearing notices by email. Do I need to re-register every year? There is no need to re-register. Your account information will carry over from year to year, however you will need to refresh the committees you sign up for as they change from session to session. Q – Where are the budget worksheets? Navigate to the Legislative information page (link found in the top/right section of the site) and you will find links to the Budget Worksheets organized by year. Prior to 2008, you may find the Budget Worksheets in the Archives. Q – Where can I find the Grant-In-Aid application? Navigate to the Legislative information page (link found in the top/right section of the site) and you will find links to the Grant-In-Aid information organized by year. Q – Where can I find a list of bills by package? From the homepage, click on “Reports and Lists” to navigate to the page that contains lists of bills and resolutions that have passed specific deadlines, daily downloads of bills and committee reports, governor’s messages, reports to the legislature from various departments, and a wealth of other resources. Scroll down until you see the “Bills by Package” option, then select the name of the package that you are interested in viewing from the drop down menu.